Improvising seasonings to add to fish results in some fascinating results. This lovely piece of Sea Bass was marinated in Salt, Pepper, Lemon Rind, sweet Paprika and emulsified with EVOO. What a great result, savory, and flavorful. And by watching the cooking time it came out of the oven, as flakey as it should be. 1. Season the Sea Bass with Sea Salt, freshly ground Black Pepper, the grated Lemon Rind, Spanish Paprika & emulsify with EVOO. Coat the fish & allow it to marinate until cooking time. 3. Heat the saute pan, add the 1 TB of EVOO & Butter. Cook skin side down, continuously spooning the pan juices over the fish, for about 5 minutes. Move the pan to the heated oven for 10 minutes, remove. The fish should be flakey and well colored. 4. 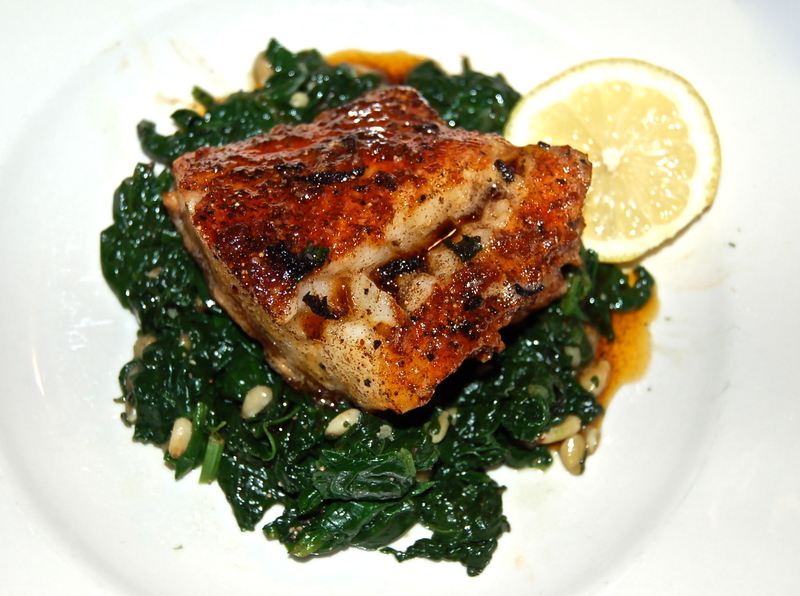 Spoon the pan juices over & around the fish, remove from the pan & place on the bed of sauteed Spinach. 3. Heat a deep sided saute pan until hot. Add the Olive Oil. When the Oil is rippling, add the smashed Garlic, cook until fragrant. 4. Add a large handful of Spinach, cover, to avoid splashing, & allow it to wilt. Repeat until all the spinach in the pan has been added. Add the toasted Pine Nuts. 5. Gently toss the mixture together & it’s ready to plate.